Waking up from my not-so-deep slumber across the Atlantic, I gratefully accepted the towel and confirmed that this whole adventure had not been a dream. I was about to meet Anthony for the first time, a man who had been a perfect stranger just nine months ago. Abjectedly Yours follows the footprints of an unusual, unlikely, enchanting friendship that evolved between two unsuspecting people. It’s the story of Anthony Chandor, an antiquarian bookseller from Bath, England, and me, Sandy Barton, a retired teacher from Buffalo, New York; it spans continents, a generation, and a cultural divide. And to think-it all began innocently enough with an online book purchase! Christmas 2010 had me searching for a unique gift for my daughter. Knowing her obsession with Walt Whitman, I decided I’d explore the great unknown and attempt to purchase a book online. A search for Whitman’s Song of Myself led me to Anthony’s website and eventually to a sale. Two days later the sale fell through, but something much more valuable grew out of the ruins. Anthony and I continued to correspond; one email led to two, ten led to twenty, and four months later we were nearing 1,500! We learned about a lifetime, two lifetimes in fact, in four months. I believed the unlikely connection we enjoyed was too good NOT to share, and decided to turn our story into a book. So, after gathering stacks upon stacks of printed emails, weaving our messages together into a tender tale of friendship became my mission. After a bit of arm-twisting, Anthony climbed onboard. We worked (via email) into the wee hours many nights, reflecting upon our thoughts and the real feelings that lingered behind our words. 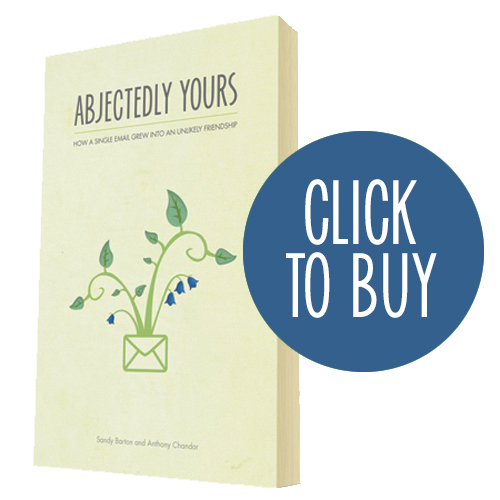 Abjectedly Yours is a “bare your soul” story, completely true, and at times, painfully honest. It’s a collection of emails and personal thoughts that take you through a failed business transaction, layers of life experiences, misunderstandings, illness, an eventual meeting and the deep affection that we share as kindred spirits. We invite you to listen in – it’s a rather sweet story. The mission is now complete, but our friendship continues to flourish. Our daily emails somehow nourish our souls and remind us of the value of human connections… unusual, unlikely, enchanting connections. … and so here’s what has happened since the last page of Abjectedly Yours was turned. But there was work to be done, a website to create, and a book to be published, so Anthony and I spent most of the days in hot pursuit of perfection. With the laptop charging, headphones and Madonna microphone in place, Anthony sat up in bed and began reading the opening chapter of the book. He reluctantly shared the mike with me, and we were able to record an author reading of Abjectedly Yours. The book was finally ready for publication in December of 2012. My dear friend Jeanne hosted a launch party extraordinaire! It was such a wonderful celebration of friends, hard work and a unique journey. The only thing missing was Anthony. But he was in Bath anxiously awaiting a detailed report. Anthony’s days at the nursing home continue to be a blessing mainly because of his refusal to wallow in self-pity. He is visited by many dear friends, and of course, his family provides the constant ebb and flow of his life. The death of his beloved Maryanne in November of 2012 was a stunning blow; Anthony’s courage, faith and abiding love gave him strength. He was able to plan and attend her service, and was greatly comforted by the beautiful words and shared memories that filled the air on a sad November day. That dreaded disease also claimed my first husband, Mark, in 2013. Mak and Jess had lost their dad, and a sense of profound sadness often added extra weight to the daily emails that still made their way across the Atlantic, between Anthony and I. And so it continues. Anthony is a newly published author – again. Not So Dusty is available at Amazon and Barnes & Noble, and is a delightful account of his experiences as a bookdealer. As for this unlikely friendship – well, it still gets its daily dose of distant nursing. It’s the gift that keeps giving! You’ve read our emails, now hear our voices! In this exclusive podcast, I joined Anthony by phone to answer some of the questions readers have been asking in the past few weeks. What was it like to meet? What has our friendship meant? What does Anthony sound like in real life?